In order to use the application, you will have to install it on your server. Installation is painless process that will set up everything you need (from database tables to configuration files) to use the application. After downloading the ZIP archive, and uploading it to your server, first thing you have to do is to create the database where system tables will be created. Let's say, you create the database called as. 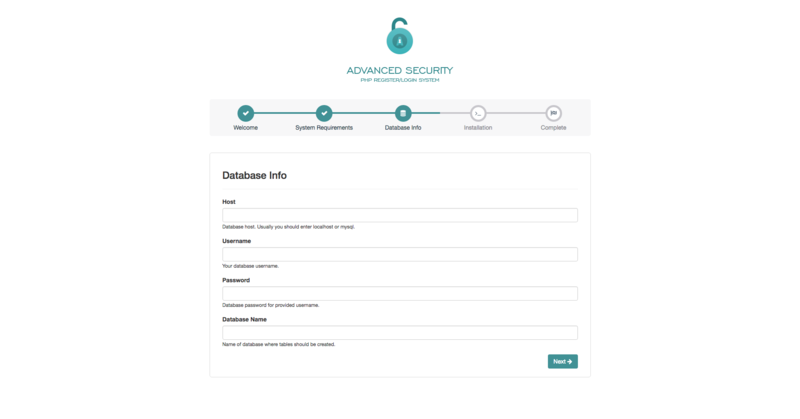 When you have your database created and ready to use, just navigate to the AS folder on your server and installation wizard will be displayed immediately. 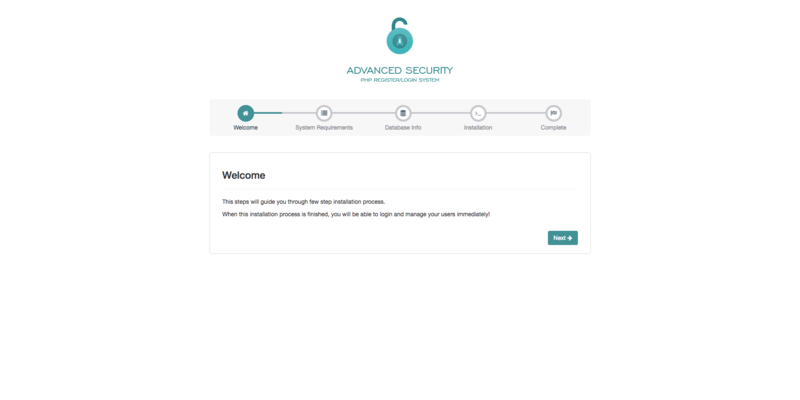 For example, if you have uploaded AS script into auth folder on your server, then you will be able to start the installation simply by accessing yourdomain.com/auth from your browser. After accessing the described url, the installation wizard will be displayed. By clicking the "Next" button in bottom right corner, "System Requirements" step will be displayed. 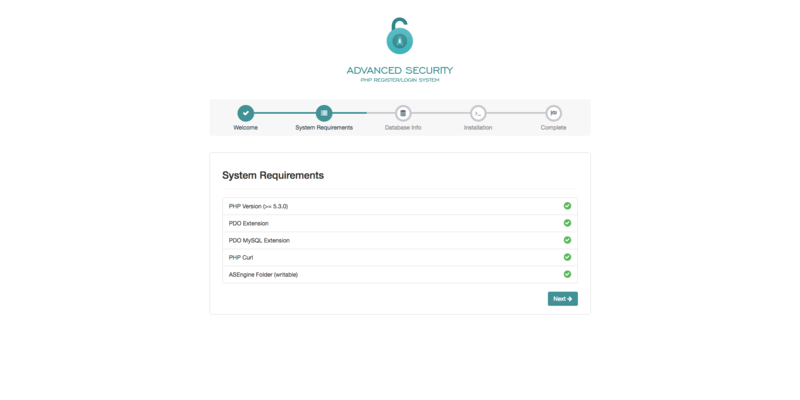 On this screen you are able to see if your server meets all requirements necessary to install and use the Advanced Security application. If your system meets all the requirements, you can proceed to next step by clicking "Next" button. On this step you need to fill in the database information required for successfully connection to MySQL database. After filling in the required fields, installation wizard will try to connect to your database and, in case there are some problem while establishing the connection, appropriate error message will be displayed. 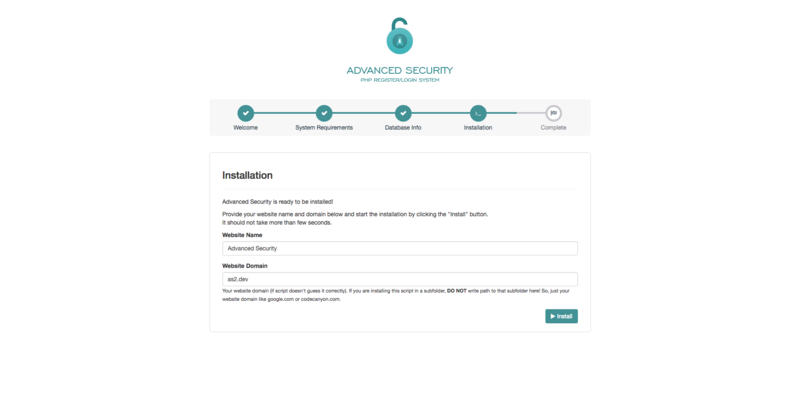 This step is final configuration step that is required to successfully install the application. Here you need to provide your application/website name as well as domain (without http://, https:// or www prefix). After you provide the required information, just click "Install" button and application should be installed in matter of seconds. Note! Since your ASEngine directory is still writable, you should change the permissions to 755 to make it writable only by root user.